The legendary Indochina journalist and author remembered…. I have been reading both of Bernard B. Fall’s classic books on the Vietnam conflicts recently. The first, Hell in a very Small Place (1966) is the brilliant account of the siege at Dien Bien Phu in 1954 and the second Street Without Joy (1961) again concentrates on the French involvement in Vietnam in the 1950s and became essential reading for the American military in Vietnam and other conflicts. Bernard B. 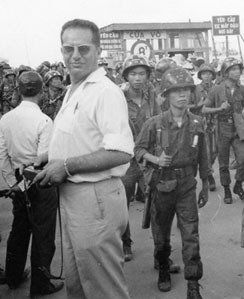 Fall (1926-1967) was an Austrian born, French educated war correspondent and historian. His father was murdered by the Gestapo in 1940 and his mother died in Auschwitz. Two years after his father’s death he joined the French Resistance and later the French Army where he was awarded the French Liberation Medal. By 1950 he had gained a scholarship at the American University of Maryland before taking a post-graduate course at the John Hopkins School for Advanced International Studies. It was here that one of his lecturers encouraged him to use his French language to study Indochina which, at that time, was relatively unknown to the Western world and an area where France had strong interests. By 1953 Fall had travelled to Vietnam to witness first-hand the war between the colonial French and the Viet Minh who were battling for Communist inspired independence. With his French citizenship, Fall was allowed to travel with the French soldiers and see for himself the severity of the beating they took from the Vietnamese fighters. He foresaw the inevitable defeat of the French before the bloodbath at Dien Bien Phu and was one of the first to report the apparent collusion of America in aiding the French withdrawal. Fall long argued that America deliberately chose not to offer assistance which would comeback to haunt them until 1975. Following the French withdrawal, Fall returned to Indochina several times between 1957 and his death in Vietnam in 1967, awarded a grant by the South East Asia Treaty Organisation, he studied the growing presence and influence of communism in the region and in 1962 met the legendary leader Ho Chi Minh and Phạm Văn Đồng in Hanoi. Fall’s grasp of the area and the politics was considerable, he predicted both the French and American’s defeat long before they happened. Unlike the politicians and generals, he understood the will of the Vietnamese people to live under their own terms and the geography of the land which thwarted the invading forces to deadly affect. Fall could see the horrific affects of short-term, high volume bombing on the country and people he had admired and loved, each visit brought greater anguish and on his final trip in 1967 he arrived with a sense of foreboding. Already suffering from retroperitoneal fibrosis which saw the loss of a kidney and a blocked colon, he felt a real sense of anguish over the fate of Vietnam but he went back with, what he wife described as a sense of fatalism. Bernard Fall died before he could finish his sentence. The landmine he trod on killed him and Gunnery Sgt Byron G. Highland, a combat photographer with the US Marine Corps instantly. Fall was a complex man, he saw conflict from both sides and whilst he deplored the actions of the French and Americans he supported the fight against communism. Above all, he believed passionately in a country’s right to self-government and for its people to live in peace.